The main line that gave way flooded the interior of this facility in the Norristown area and needed water extraction. When the standing water is allowed to remain for a full day the walls ofter suffer significant damage. SERVPRO attempts to limit demolition since we try to restore and not replace building elements whenever possible. Here we can mitigate the damage rapid drying using air movers and dehus after the controlled demolition. The swift removal of contaminated sewage after a blockage in East Norriton accomplishes three essential elements. The extraction mitigates water damage to the bathroom, the disinfecting of the affected area is crucial to maintaining a wholesome and healthy household, and it simply makes the customer relieved. That is why many property owners rely on SERVPRO. Get it down right, and fast. 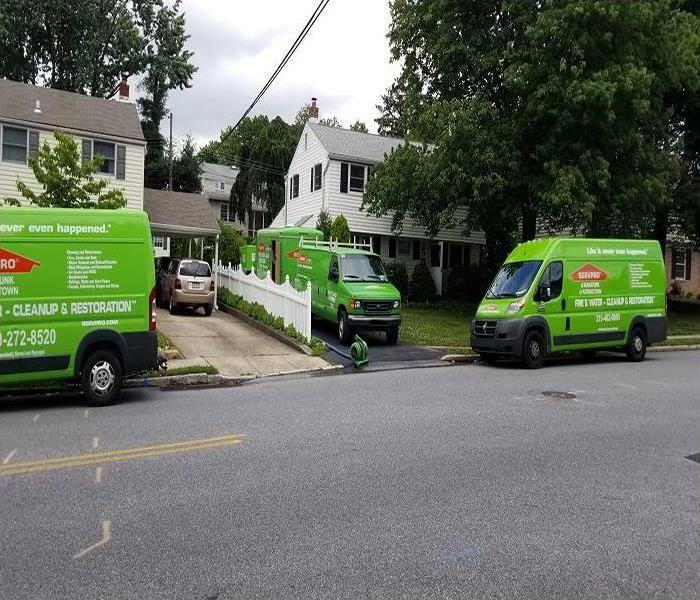 SERVPRO of Norristown has a team of highly trained mold remediation specialists that are ready to respond 24/7 to your emergency. Our experts can handle any size mold infestation. We have the advanced equipment and experience to restore your commercial property to pre-damage condition. 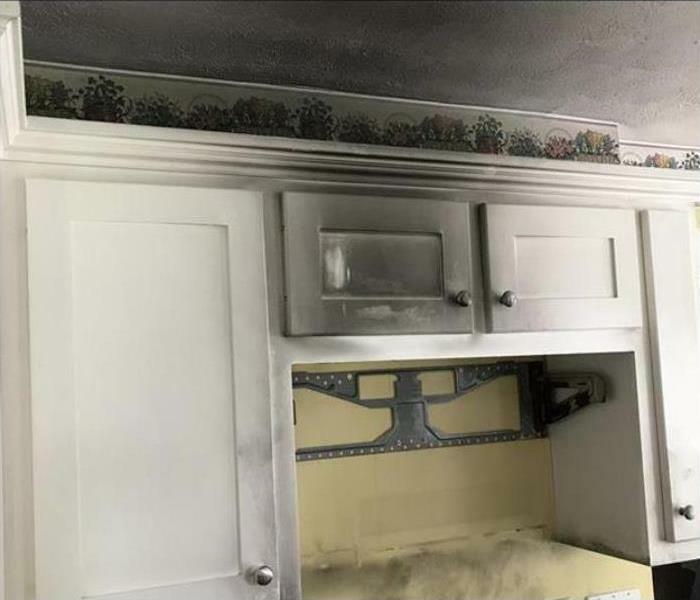 When the fire is out, often the main battle is with smoke odors and stains. 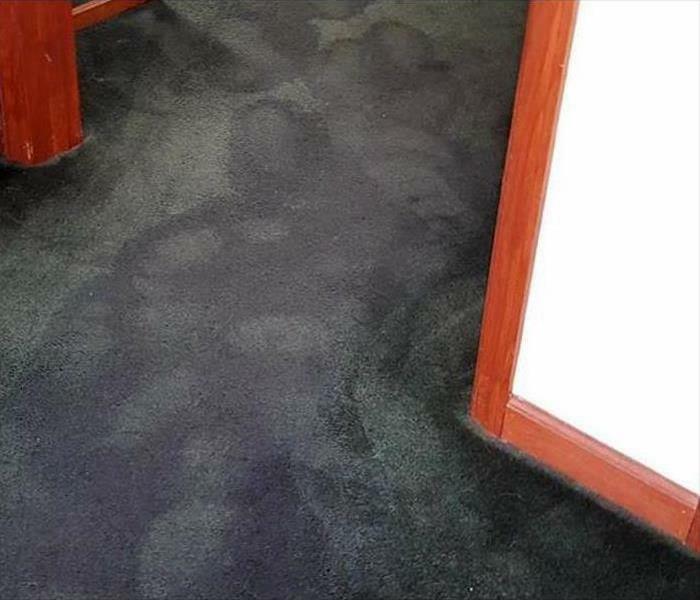 This house in the East Norriton area needs the SERVPRO of Norristown experts to start the vacuuming up of particles and the odor removal to start quickly. 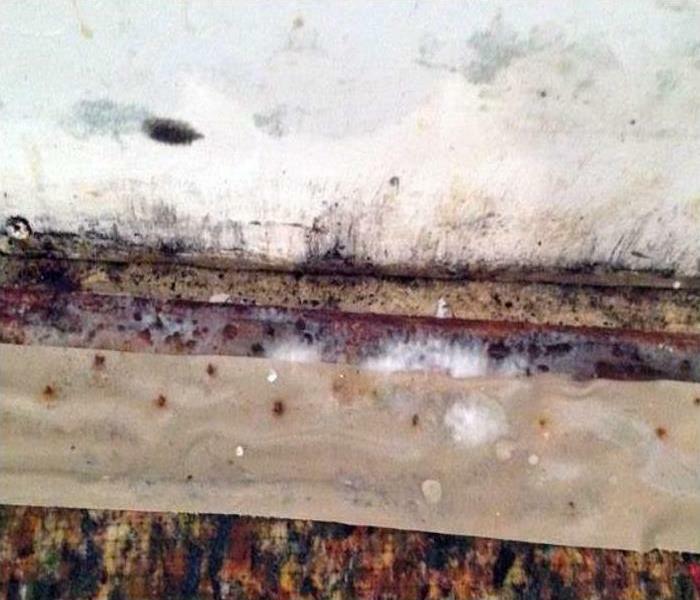 Mold damage developed in this Norristown house’s bathroom. When SERVPRO of Norristown is called in to clean up mold in a residence or commercial property we routinely set up containment area to stop mold spores from traveling throughout the facility while we are performing our work. The photo shows a typical containment area. This photo in an East Norriton basement shows the end play of storm damage cleanup and restoration. The storm-contaminated water has been extracted, leaving drying and dehumidification equipment to restore normal moisture levels to a concrete block basement. 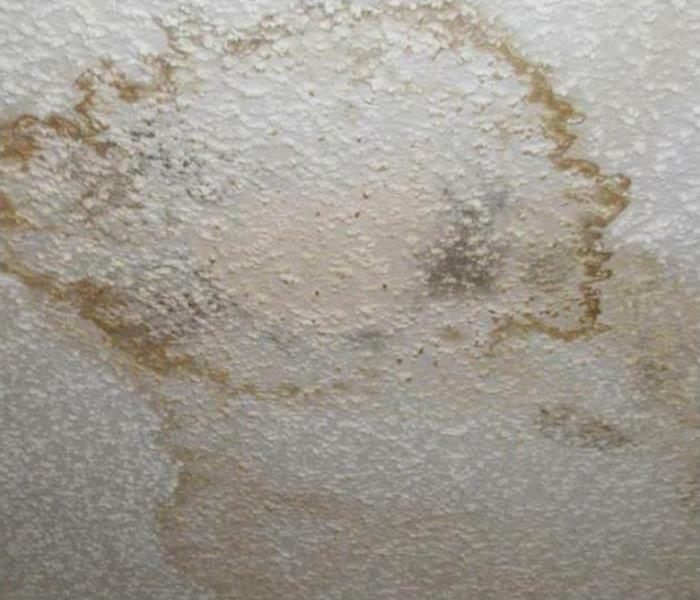 Rely on SERVPRO techs to get it done right, and remove all unwanted and damaging moisture. The small fire slightly damaged the furnishings, but the smoky film on the wood surfaces needed careful cleaning in this East Norriton bedroom. 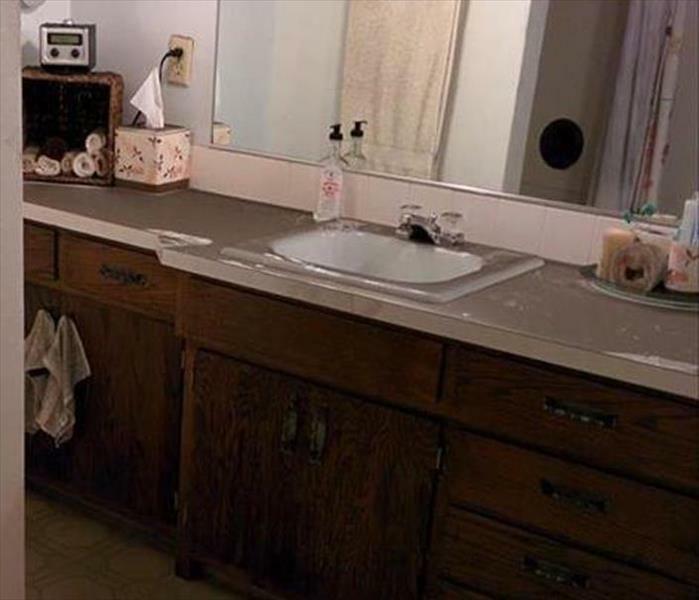 Using spray bottles with SERVPRO formulated cleaning products, clean clothes, and sponges, we can clean this up. Water damage at this Norristown house was the result of a second-floor plumbing leak. 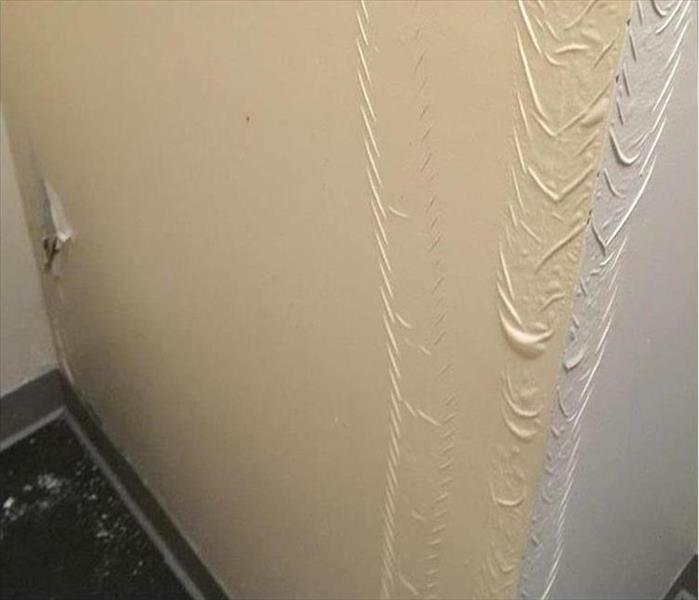 The resulting moisture in the ceiling surrounded an electrical outlet for a light fixture. 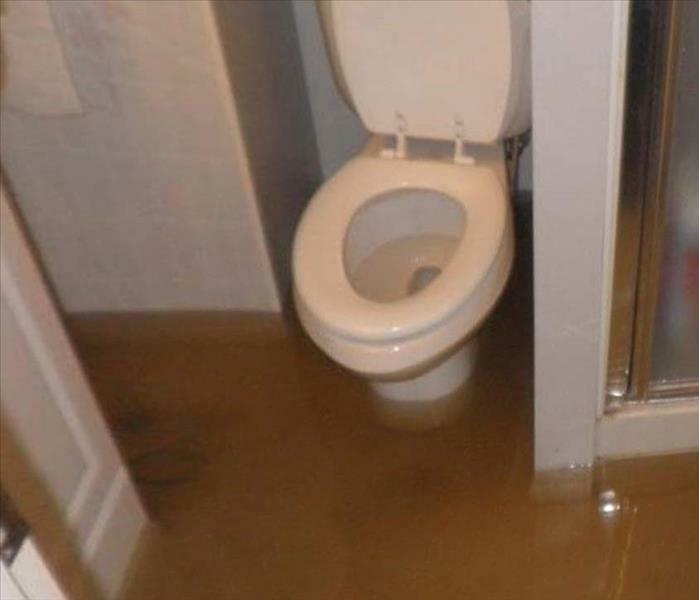 The homeowner thought it best to call for professional help considering the location of the water damage. 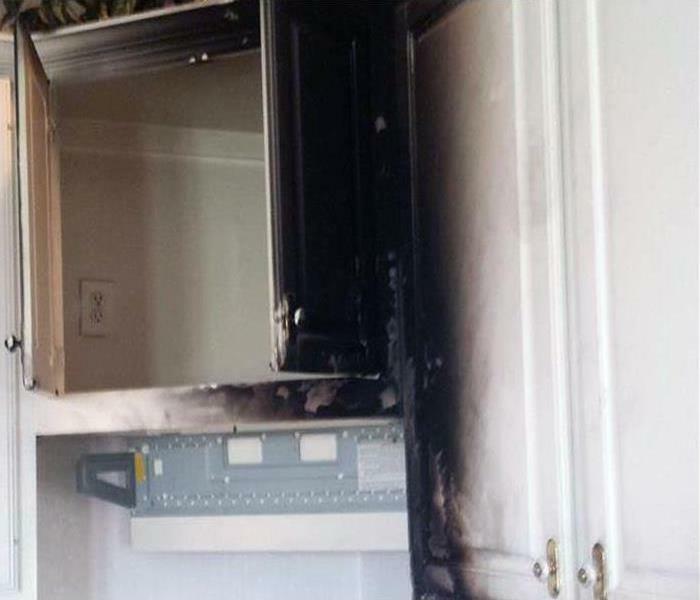 SERVPRO of Norristown would be a wise choice to remediate this damage, and we provide 24/7 emergency service. Mold damage was discovered in this vacant Norristown building. 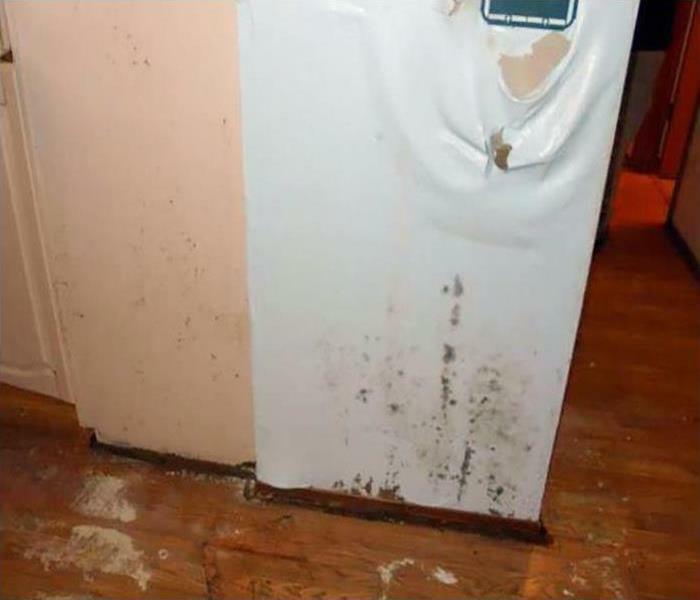 As the photo shows, the mold infestation was severe. The walls and ceiling were littered with mold. SERVPRO of Norristown would demolish and remove all of the non-salvageable walls and sections of the ceiling. 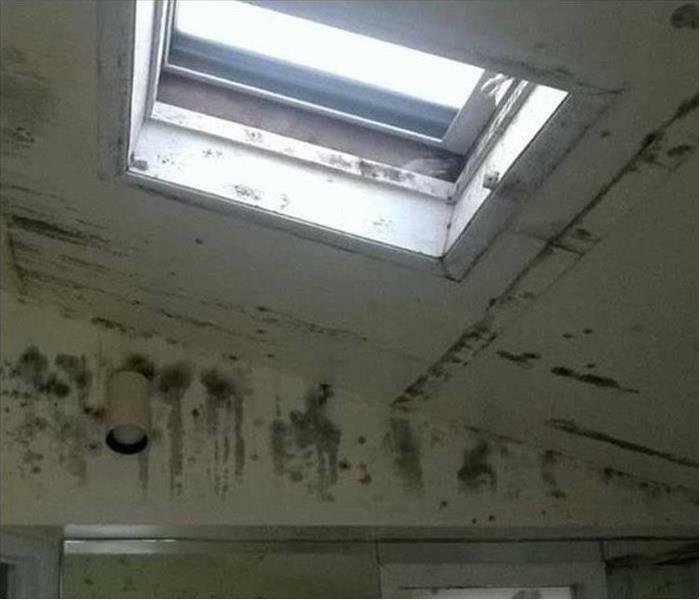 They would clean mold from the areas that could be restored. The entire affected areas would be treated with an antifungal product before the rebuilding process began. The property owner would have to control the air temperature and moisture levels to prevent future mold infestations. Winds, water can wreak havoc on commercial buildings in the Norristown area quite frequently. 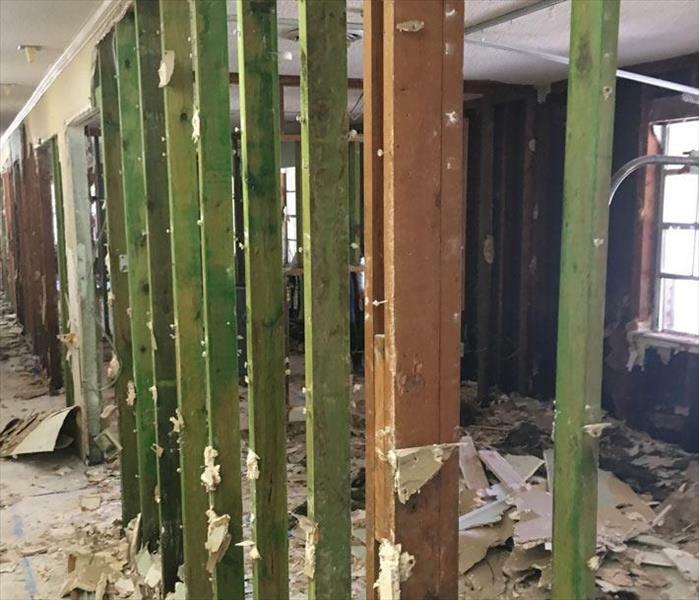 SERVPRO is always available to clean up the mess as this demolition work is in progress. Preparing the storm-damaged area for reconstruction is the goal. Where there is moisture there is a chance mold will grow and spread. Our staff is ready and available 24/7 to assist you with your mold infestation. SERVPRO has IICRC certifications, advanced mold remediation equipment, training, and mold damage experience to restore your home to pre-damage condition. SERVPRO of Norristown is Faster to Any Size Disaster! Water damage struck this Norristown office when the fire-suppressant sprinkler system malfunctioned. 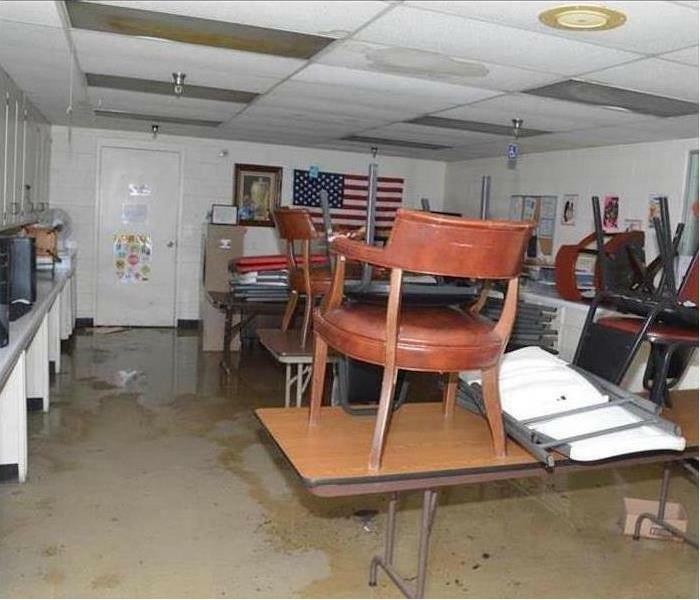 The hallway and several office suites were drenched with water. The building management acted quickly to turn the water off and to seek the help of a professional water damage restoration company. SERVPRO of Norristown has the equipment resources and personnel necessary to mitigate water dame events such as this. The photo describes the significant damage to a Norriton kitchen after a partial demolition. SERVPRO can respond and can do as much as possible to mitigate storm damage by quickly removing the remaining water. Then disposing of drenched, and unusable cabinetry and flooring falls by intense efforts for dehumidification. 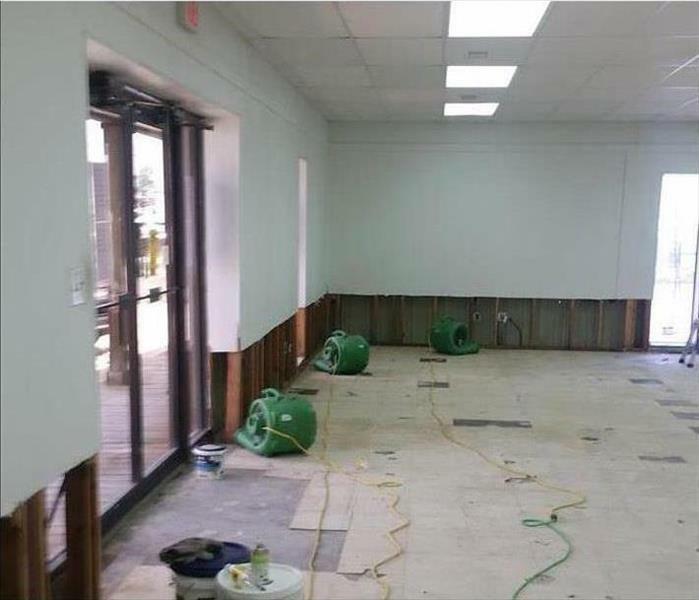 SERVPRO of Norristown is available 24/7 and will respond quickly to your commercial water damage emergency. Our team has the advanced equipment, specialized training, and years of experience to restore your commercial property to pre-damage condition. We are locally owned and operated, leaders in the restoration industry, and Faster to Any Size Disaster. 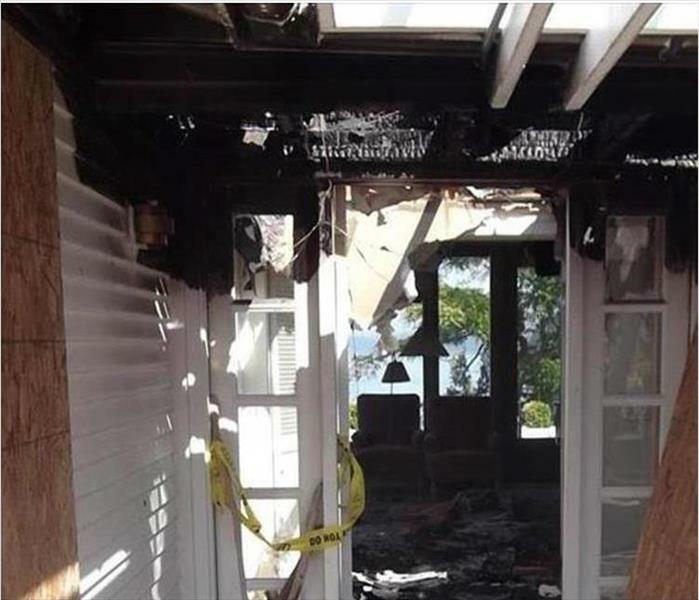 Hair curlers have caused many fires in homes, whether in Norristown or other areas of PA. SERVPRO can mitigate fire and smoke damage by quickly wiping down the greasy residues and setting up a hydroxyl generator to help neutral the smoke odors. 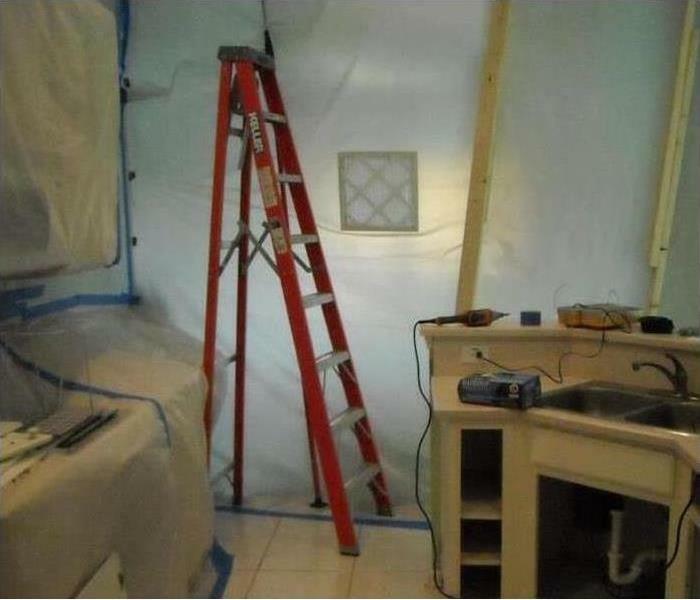 Mold damage remediation at this Norristown home included the construction of a containment area before the beginning of our work. Containment area such as the one pictured prevents mold spores from disbursing throughout the residence while the mold damage is being cleaned up by our technicians. Water damage at this Norristown condo spread over the flooring in the kitchen and wicked up the lower portions of the base cabinets. All of the furniture on the floor was also affected. 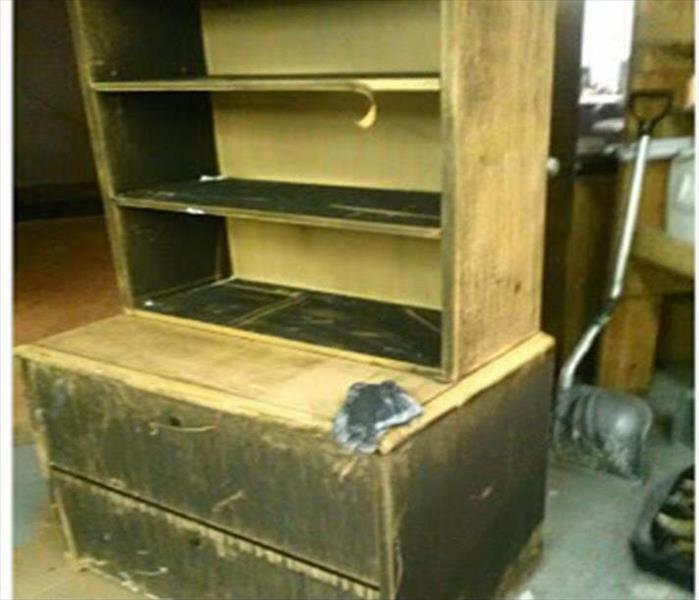 Our technician's first concern would be to move the furniture to a dry place where it could be dried and restored, and then they would move on to water clean up. They would employ heated commercial air movers to aid in the drying process and to correct the damage to the base cabinets. 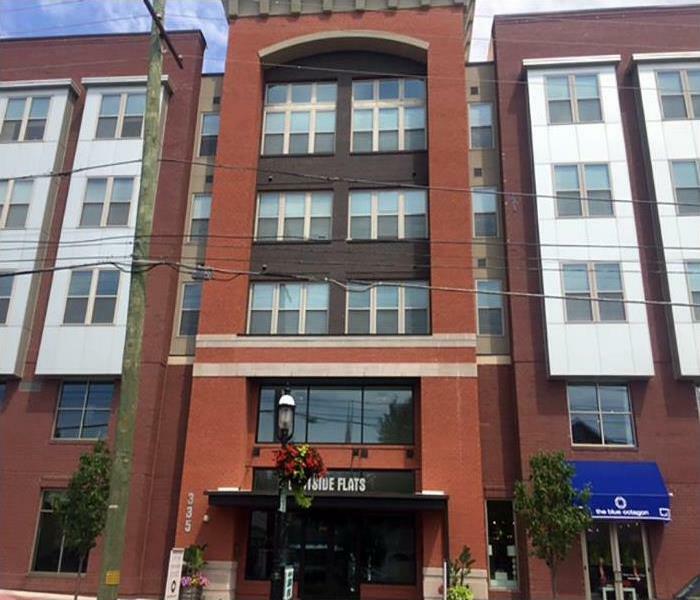 SERVPRO of Norristown is available 24 hours a day to help restore your Norristown and Philadelphia area commercial property. We have the equipment and highly trained personnel to handle your commercial fire, smoke, water, storm or mold damage. So when the need arises for emergency restoration services, SERVPRO of Norristown is ready to help. We have worked with Chestnut Hill College in Philadelphia as well as Small Retail Stores, Large Retail/Big-Box Stores. High-Rise Residential, Manufacturing & Industrial and Government/Military buildings. 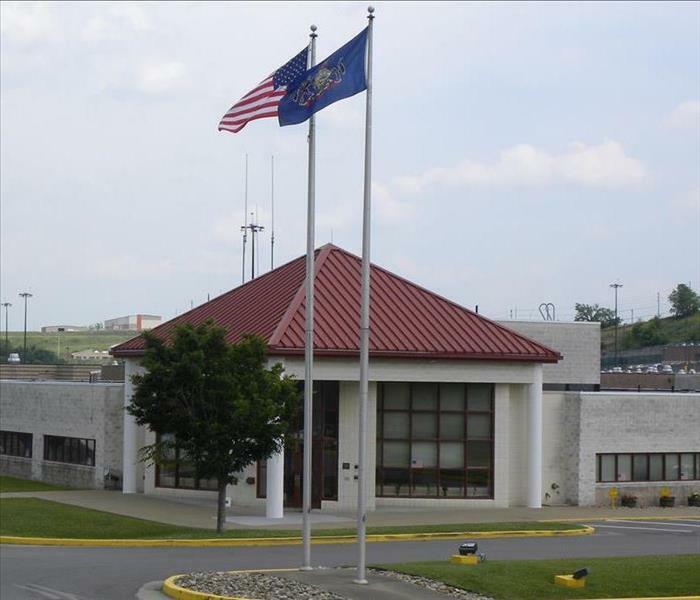 Because of our well-known reputation around the community, the team at SERVPRO of Norristown has been chosen to provide ductwork cleaning and air-handler services for the Pennsylvania Department of Corrections - SCI Greene Maximum Security Prison. Our team of professionals has many years of experience in the cleaning and restoration industry, and because of that, we can tackle any size project - even inside max security prison blocks. We always think outside the box, and we are always ready for whatever happens. 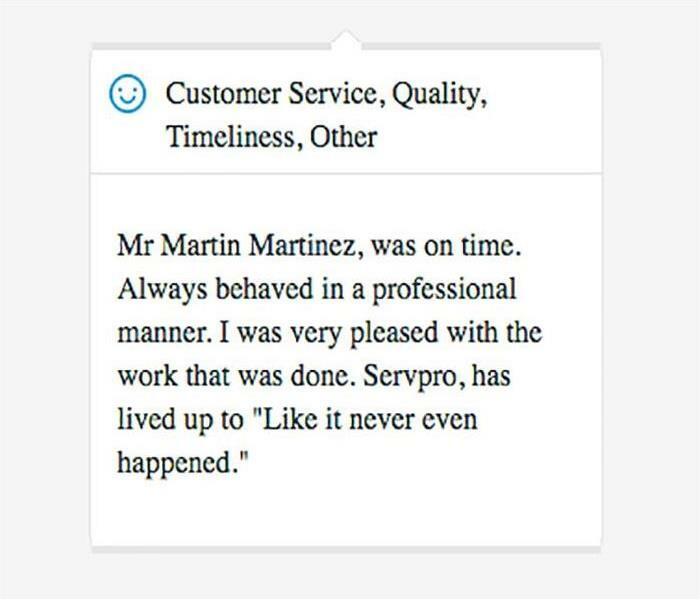 At SERVPRO of Norristown, we enjoy hearing from our customers. A customer left a review saying how professional our staff was and that they were pleased with our work. 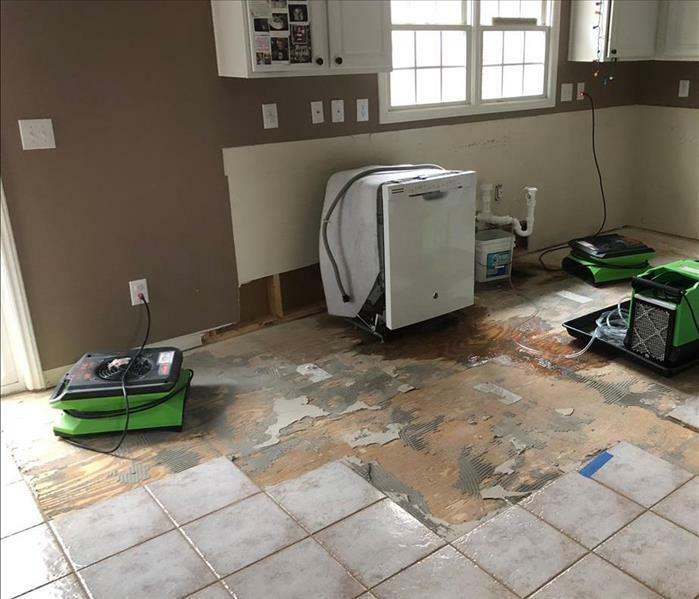 We are glad to make it “Like it never even happened.” If your property in Norristown and Lower Providence Township area has experienced water damage, contact the experts at SERVPRO today! 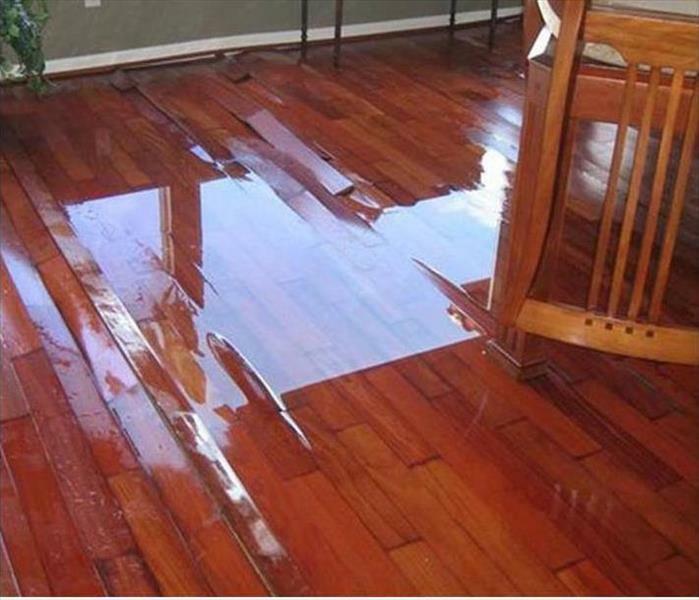 The groundwater inundated the oak hardwood flooring in this Norristown home. 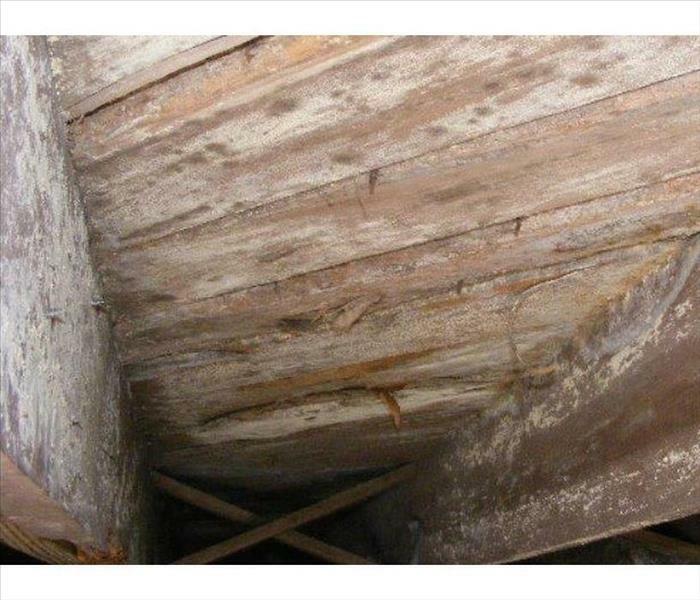 The warped and lifted planks may be salvageable if a removal and drying out is done immediately. The subfloor and supporting joists must also be free of excess moisture before a reinstallation and refinish of the top flooring. Count on SERVPRO for great assistance. Storm damage at this Norristown office was due to a portion of the roof being torn away during a thunderstorm that carried high winds. 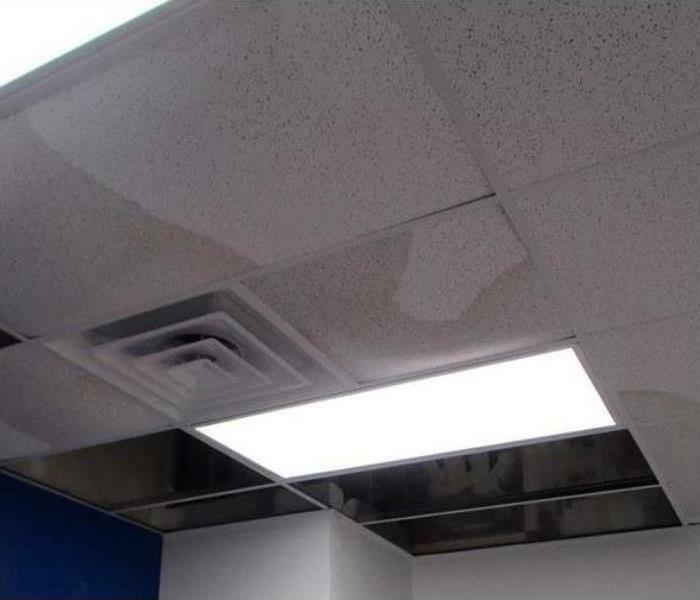 A great deal of rainwater fell through the damaged roof into the interior of the office. 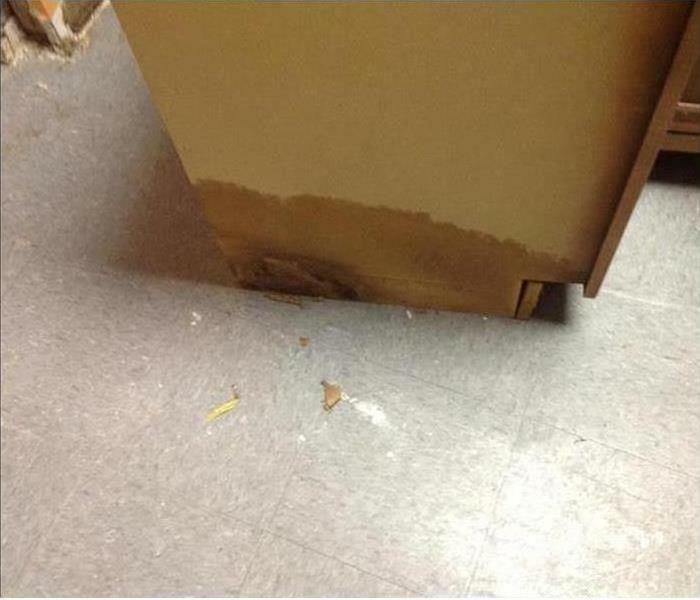 The team at SERVPRO of Norristown was called to handle a commercial water damage emergency at East Side Flats in Malvern. The building suffered significant water damage that had to remedy quickly. Our technicians arrived quickly and began the water damage restoration process. At SERVPRO we have the expertise and equipment to handle any size property. 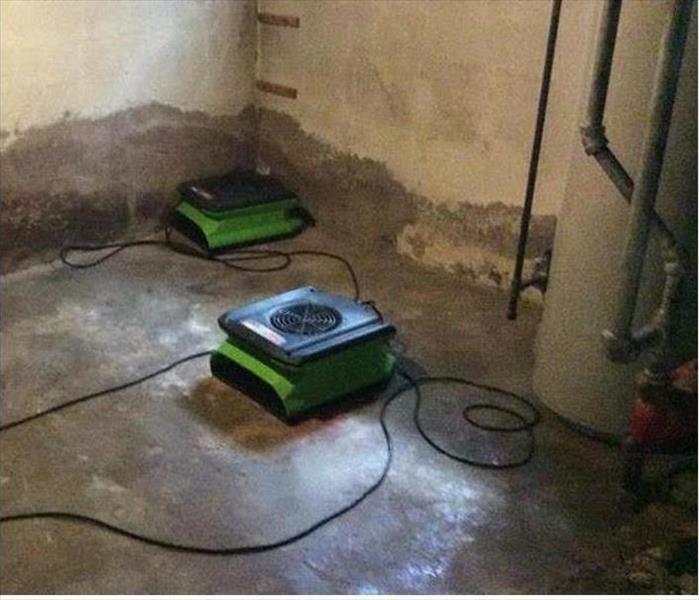 We used industrial wet/dry vacuums and submersible pumps to avoid mold growth and secondary water damage. 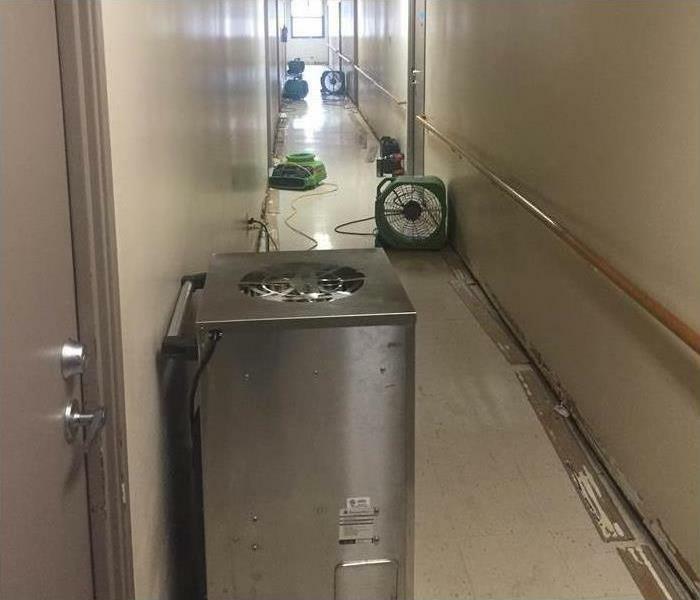 High-speed air movers and industrial-grade dehumidifiers were brought in to speed up the drying process. 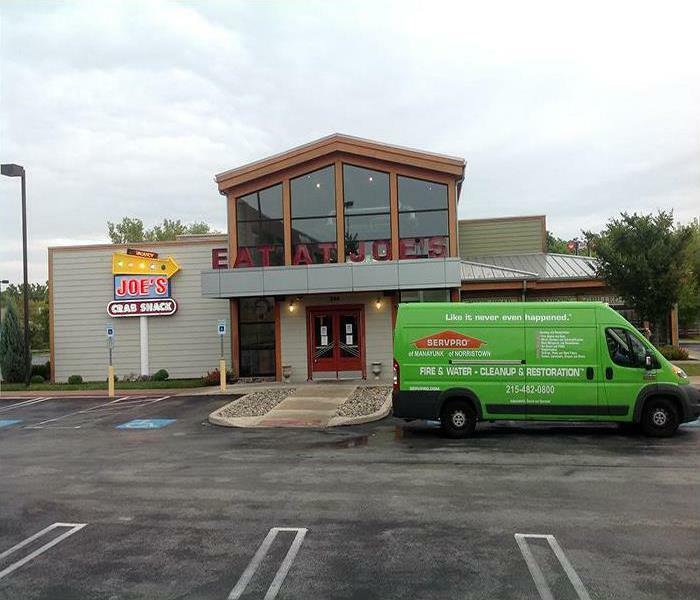 We cleaned and restored the commercial property to pre-damage condition. The client said “The SERVPRO team came out quickly and got us situated just as fast. We appreciate everything they did. " 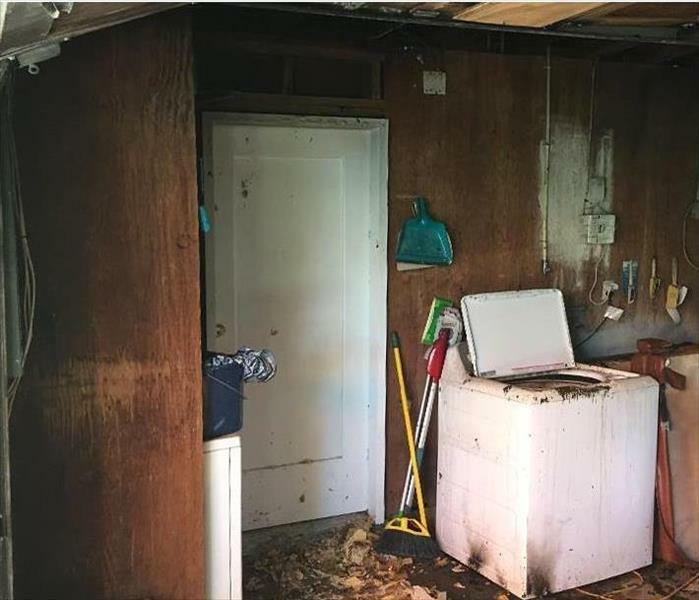 The electrical fire started by the washing machine in this East Norriton garage lit and burned clothing and dispersed a heavy residue of smoke and the accompanying odors. The SERVPRO cleanup involved not only sweeping up the debris but setting up an hydroxyl generator to eliminate the foul odors. Our team of highly trained and certified technicians responded to a commercial cleaning call in King of Prussia. Unlike a janitorial service, our experts have specialized equipment and training to remove any odor or stain. 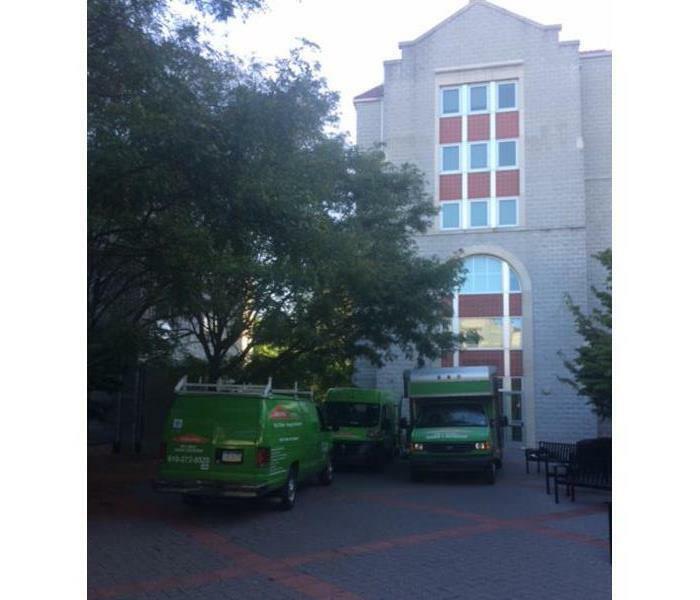 Our crew at SERVPRO of Norristown cleaned and sanitized the property back to new! The clients were thrilled with our services they told us "Thank you again to you and your team, the restaurant looks really great!" If your commercial property in Philadelphia needs a thorough cleaning do not hesitate to call the specialists at SERVPRO! This facility in Norristown needed a full array of drying equipment once the water was removed. 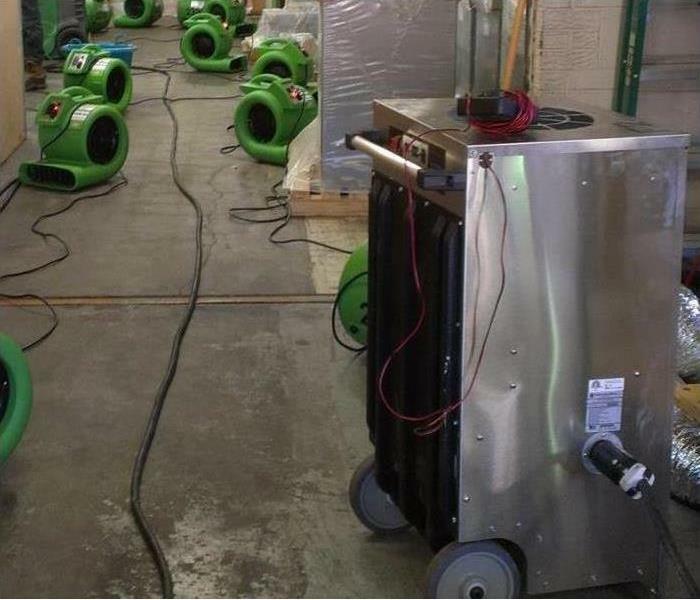 Pictured are air movers and a dehumidifier to pluck excess moisture from the ambient air. Rapid return to normal Relative Humidity levels preserves the inventory. The running water flowed from this unattended tub and gravity did the rest as the verticle water damage was devastating. 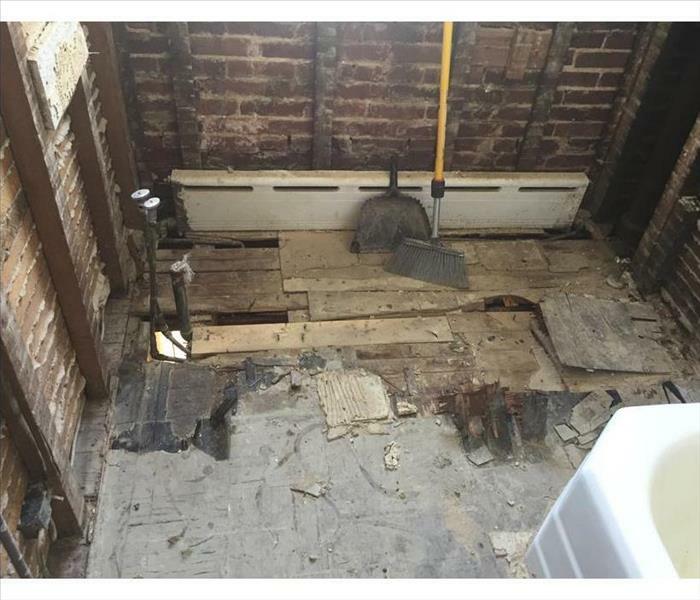 Our SERVPRO of Norristown technicians demolished the walls, flooring, sub-floor beams, and all the wall below this bathroom. In many Philadelphia houses, mold proliferation takes hold very fast in the nooks and crannies of old timber. We wrapped and discarded the non-salvageable construction materials, disinfected the affected areas, and set up for the renovation. Our goal is to make our customer feel "Like it never even happened." 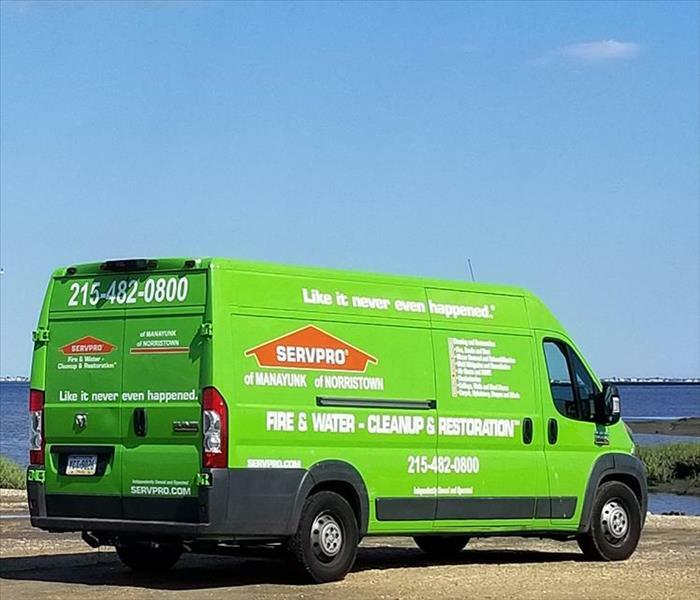 The Green SERVPRO of Norristown fully equipped emergency restoration van is overlooking the Atlantic Ocean in famed Atlantic City. Our franchise, a member of a SERVPRO Disaster Recovery Team, excels at responding with a wide array of equipment, manned by top professionals, to urgent commercial fire and water damage cleanup and restorations. Don't bet on the wrong company to keep your business doors open, call SERVPRO. SERVPRO of Norristown received a call from a homeowner in Norristown regarding a water damage emergency. Our team of highly trained technicians arrived quickly and started the water damage restoration process. We used advanced drying techniques and state-of-the-art water removal equipment to restore the property to pre-damage condition. 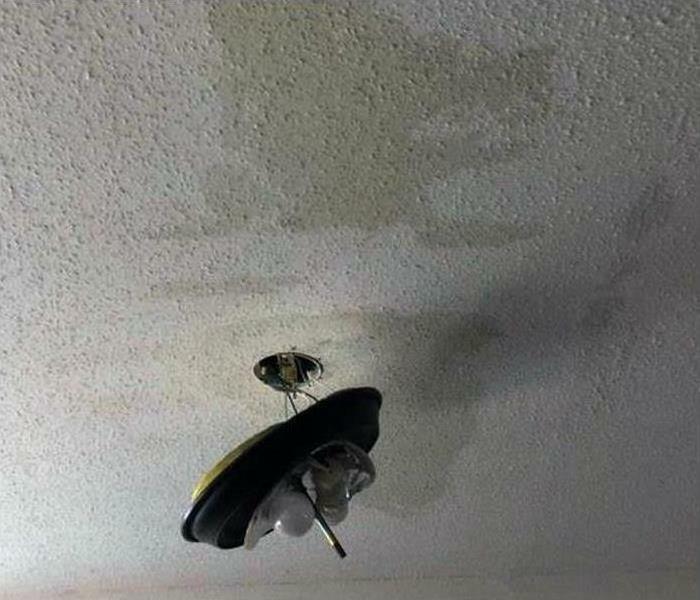 Don't let water damage destroy your house, contact SERVPRO for assistance. The leak from the plumbing soaked this wall in Norristown leading to bubbling of the latex painted surface. The leak was stopped, and the peeled away paint revealed non-salvageable drywall panels. After the demolition, the exposed wall cavity was sprayed with antimicrobial agents before the repair began. Count on SERVPRO to do it right. The electrical short charred the building elements of this entrance to a property in Norristown. The fire damaged area was boarded up for security, and then the demolition proceeded. Our SERVPRO technicians completed this cleanup and then started the restoration quickly, much to the satisfaction of our customer. The white mold growing in this Township crawlspace resulted from a lack of circulation leading to a moisture buildup. Our SERVPRO team used "ice blasting" to chafe the fungi from the support beams and hardwood flooring. This method was efficient, cost-effective, and preserved the wooden elements. We recommended to the homeowner to allow us to install a stationary dehumidifier for moisture control.